Getting to the interview stage is not an easy process, and with so many people all applying for the same job it is imperative your résumé is of the highest standard with zero errors. There are lots of important aspects an employer expects to see on a résumé, from the attention to detail, to the presentation, the layout, the font used, and of course the skills, qualifications and experience on offer. A résumé is typically a one page document that showcases the qualifications and experience of a potential candidate to a prospective employer. A résumé will also include the candidates contact details in addition to education, skills and relevant work experience. Writing and sending a résumé is the first part of the hiring process, and considered one of the most important aspects of gaining employment. To stand a good chance of getting an interview against so many other applications a résumé will typically need to be of the highest standard, and should contain zero errors and show the employer that the candidate is the right person for the job. A résumé can often get mistaken for a CV (Curriculum Vitae) and vice versa, and although quite similar there are still some noticeable differences between the two. The main difference between a résumé and a CV is the overall length. A CV will typically be between 2-3 pages in length, whereas the standard size of a résumé is just one page. Who uses a CV and who uses a résumé? A résumé is primarily used in America and Canada, and a CV is primarily used in the United Kingdom. Although they are both used for the same purpose, they are quite different in the amount of information and detail contained within. A CV will typically document almost everything the candidate has to offer, ranging from their entire employment history to their skills and qualifications, and a complete detailed section on their education. In comparison, a résumé usually sticks to just one page and includes only the most recent work experience, skills and qualifications. A résumé is a more direct ‘no nonsense’ approach to applying for a job, but when it comes to the CV you are going to see a much more detailed approach which would often include everything the candidate has achieved to date. There are some exceptions when it comes to using the CV as the template for a job application, and in the United States they can be used for certain professions such as academia, medicine and science. These professions often require a more detailed list of achievements and quite naturally benefit more from the CV format than the much shorter résumé. What should I include in my résumé? Employers don’t spend a great deal of time on each résumé – make sure it’s obvious you fit the job spec! Due to the usual one page format of the résumé you would be expected to keep your details short and to the point. To summarise, the minimum you should provide is your contact details, your employment history, and your education and qualifications. However, most candidates will also include a career summary, their core skills, any volunteer work, and additional qualifications which are relevant to the role. The most important aspect of writing a résumé is to keep everything short and relevant. The employer will naturally provide all you need to know on the job advert, which will contain the skills and qualifications they require in order to gain a position in their company. A successful candidate will create a résumé that will take note of these requests and tailor their application to the role ensuring everything is relevant. A recruiter can receive a huge amount of résumés for just the one posting, so the résumé format is well designed to allow a quick read of each one to determine who may be asked to attend an interview. In addition to this the employer may use the ATS application to quickly search and narrow down the field using the right keywords. It is vital that a candidate not only provides relevant information but also tailors the résumé to the role they are applying for, and uses the right keywords as seen in the job advert. Someone who has all of the right skills and qualifications may not even make it past the Applicant Tracking System if this isn’t followed correctly. At the very top of your résumé you should include your contact details. This will be your name, your contact telephone number, your location (city, state and zip code), your email address, and LinkedIn profile URL. A mistake which is commonly made when writing a résumé is to miss off an important piece of contact information. An employer may have a preferred method of contact so it’s really important you provide both a contact number and an email. You should also provide a number which you can either answer immediately or can check the voicemail quickly to respond. Never provide your current work number for obvious reasons. One thing to avoid is using an unprofessional email address like ‘footiefan@gmail.com’. Although it may seem funny and quirky to you, not everyone will think the same and it’s a much less riskier approach to use your own name to ensure everything remains professional. Creating a new email address to use for your résumé is a good way to ensure you have a professional email address, and it will also help you easily spot any replies from an employer as there will be little to no spam for a response to get mixed up in. Finally, always create a professional LinkedIn profile for recruiters to read. It will help the employer to verify your qualifications and provides further information that may not be on your résumé. Including details that are unnecessary or unprofessional can lead to your application being rejected. LEAVE IT OFF: Don’t include your marital status, number of children, nationality, gender, religion, orientation or any other such personal information unless (in very exceptional cases) it is 100% relevant to the job. As an option you can decide to add a ‘career objective’ or ‘personal statement’ at the top of your résumé. This will help the employer see who you are, the most important points that show you fit the job specification, and what you are looking to achieve in the future. It also can show them that you are passionate about a certain role or industry. This should be kept short and to the point, bearing in mind that you only have one page with which to work with. 2 – 3 lines is a typical length for this section. If you feel this would add value to your résumé then go ahead and include it. Your employment history, work experience or also known as professional experience is placed in the very centre of a résumé and will provide the most information. This is where the employer likes to see relevant roles and transferable skills, so ideally you not only want to have your most recent roles here but also previous positions that are similar or the same as what you are applying for. Typically most people move onto a similar role and are able to demonstrate to the employer that they already have the skills and knowledge which will carry them into the new role with ease. If you are trying to stick to just the standard one page résumé then you don’t need to go back too far with your work history, and instead focus upon your most recent roles. You will be expected to list the company name, the location of the company, the job title, and the start and end date – just month and year is fine. Underneath this as a separate subheading to list the tasks/responsibilities and your achievements within those roles. You do not need to list every single task and you should always just focus on your main duties and ones which the employer is going to be most interested in – again keeping everything relevant and on topic. Space is obviously very limited so try not to expand too much and use bullet points where necessary. What an employer is also interested in is how you performed in those roles. Not only should your list of previous roles detail the tasks, it should also show how you made an impact. An employer is looking for actual results which could be explained either by providing stats and figures or detailing situations and process changes that resulted in a positive outcome. Provide instances where you generated more revenue and where your ideas created a positive impact for the company and the customer. Only provide outstanding achievements here as you don’t want to dilute the quality of your experience with standard daily expected results. Try to provide real examples rather than just claiming to have particular skills. Not every employer requires a particular qualification, so the emphasis on education and college or university degrees will differ from each job posting. You should hopefully be aware of what’s required in your field of expertise, but always make sure you fully read the job advert so you don’t apply for something you realistically won’t get. If a qualification is not essential and you have many years of work experience, then you may decide to put more emphasis on the skills and knowledge you’ve gained and not worry too much about your early high school achievements. If you got fantastic grades throughout high school and college, then of course you may choose to show off those achievements – and rightly so. Even if a certain qualification isn’t essential you would always detail any that you have gained as this would likely impress any employer. State the institution along with the degree and the grade you achieved, and the date. If you are a recent school leaver and have little or no work experience then you should put your education above the work experience section. Having no work experience at all and applying for your first job doesn’t mean that you shouldn’t have a work experience section at all. Any volunteer work can go here because it is still work at the end of the day! Your focus would clearly have to be on your education with the lack of work experience, and assuming you are applying for an entry level position then this would be expected by the employer. Although work experience is always a valuable part to have on your résumé, everyone has to start somewhere and the valuable skills you’ve learned from your education should be the main focus. Any extracurricular activities along with your coursework should be the highlight of your résumé, and don’t forget to always try and represent how these skills will be of benefit to an employer. The hiring manager will be looking for the standard foundation skills which would be expected of any employer, like good communication skills, team working abilities, idea generating skills, and one of the most important – problem solving skills. Try to provide as many instances as possible that demonstrate how you’ve gained these skills and how you are now ready for employment. When it comes to adding your skills to the résumé it’s important to remember how those skills will be perceived by the employer and how beneficial they will be. Your core skills section (core competencies or key skills) should sit above your work history and should be kept to around 4-6 in total. This section isn’t always included on a résumé and should be something you consider omitting if you are struggling to keep to the standard one page. Although your skills would be considered very important, you may be able to cover this section with your work experience. In any case, your skills would only take up a few lines if kept to a minimum and presented using bullet points. The choice is yours whether you want to include a ‘core competency’ section, so think very careful about what you think the employer is going to gain from this. Having a fantastic employment history section is far more important in most cases, so don’t be afraid to leave this part off. Finally, one thing to consider is the ATS tracking software an employer may be using. There could be certain keywords you want to identify and use on your résumé within the skills section that will help your résumé to be tracked easily. So if you are going to add a skill section above your employment history, make sure the wording matches the job advert or at the very least uses obvious keywords like ‘customer service’ or ‘Microsoft Excel’. Where relevant, this section is a fantastic way to demonstrate to an employer your outstanding performance during a previous role. You should include any and all accolades you received ranging from employee of the month to other internal and external awards. Customer service based roles will often have monthly awards given to employees for outstanding performance, whereas a technician may be entered into a national award for excellent service. Any kind of award you won or were even nominated for can be showcased on your résumé if you feel it will add value to your application. What layout should I choose? Above: Our Developer template is a great example of a one page design that would work well for any keyboard-based role. Your layout really depends on the role – sometimes an innovative, creative design will be appropriate whilst other times, a more formal style might be preferred. Don’t feel confined to choosing a template that has been tailored towards a particular role – or choosing a template that is described résumé. It’s really easy to customise templates to any layout and to suit any position, giving you more choice and flexibility from the full collection. 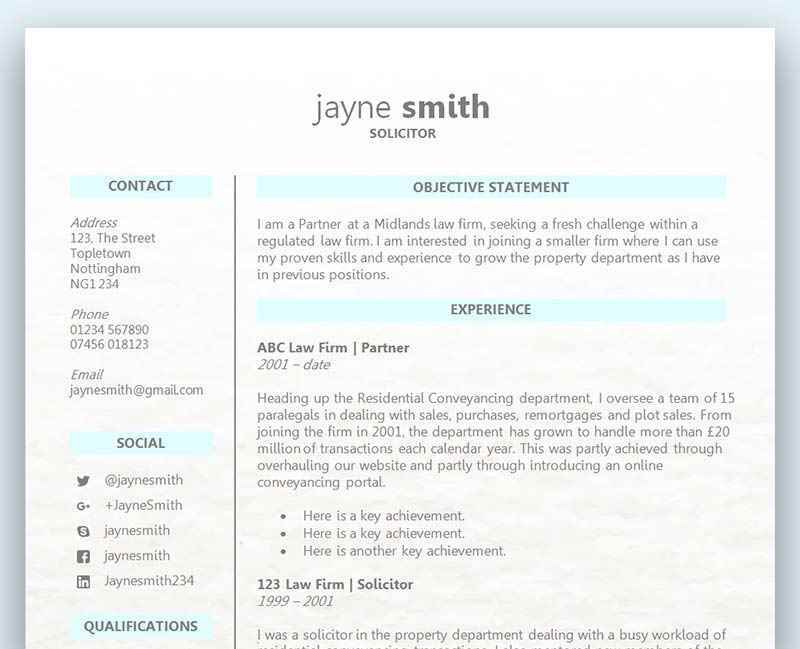 Click here to view our collection of free résumé templates. Can I just send the same résumé to a bunch of employers? No matter what you decide to include on your one page résumé, you should always tailor it to each role you’re apply for. The employer has to read through so many applications that you want to make it as easy as possible for them to see that you are the right person for the job. To give yourself the best possible chance of gaining an interview you need to take great care in reading the job advert. This will contain most of the information you will need to ensure your résumé stands out from the rest of your competition. Not only should you extract the keywords and phrases from the job advert for the ATS software, you should also do it just to make the employer’s life much easier. The hiring manager will literally only spend a few seconds reading each résumé, so you want them to instantly notice that you are the right person for the job. Remember, the person who wrote the job advert is very likely to be the one who is going to read your résumé, so you want to make sure you are on the same page. Yes! Don’t miss this great video by career expert and award-winning author Andrew LaCivita on writing the perfect résumé!